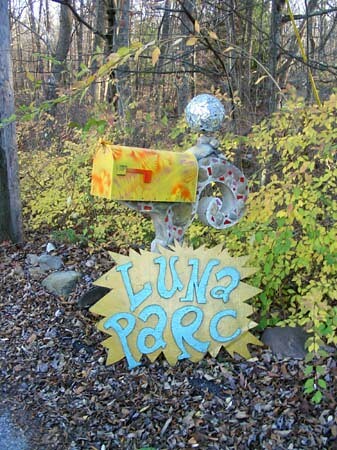 When one enters the gates of Luna Parc, you are welcomed by colorful signs, whimsical mailboxes and a sidewalk covered entirely in various colored tiles. In fact it seems almost everything is covered in beautiful tile work, and not those 4×4 inch tiles you find in the bathroom. 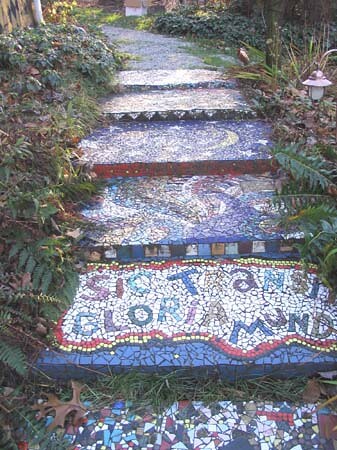 I mean intricately designed, hand laid pieces of tile. There is also a sense of whimsy to the designs, almost Dr Seuss like in the way pieces curve and move, and how different elements are married together, such as this mailbox. 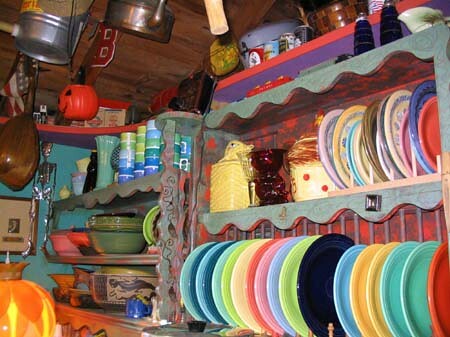 There were plates of every color all arranged neatly, same with a half dozen plastic colanders hanging from the ceiling. 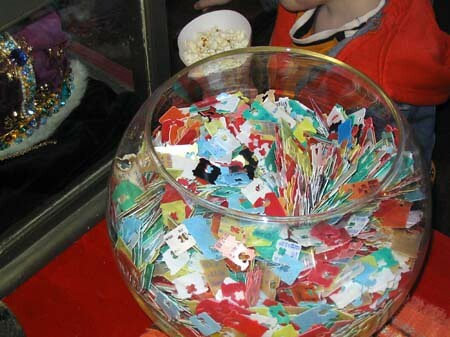 There is all sorts of art work and carvings all thruout the house, and various collections, such as a collection of dice, numerous lava lamps, and even a gigantic fishbowl full of the plastic snap on pieces that close off a loaf of bread…. By far the coolest room was the bathroom. First of all this as the biggest bathroom I’ve ever been in, easily 20 feet wide. More importantly it was a circle, and everything was against a wall with an overhead shower in the middle of the room. 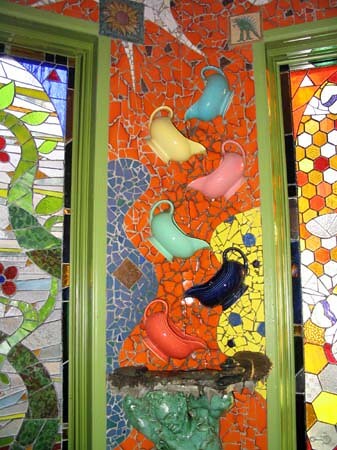 As expected the entire room was covered with beautiful tile work, and color flowed (literally) thru a series of differently colored gravy boats. I won’t even talk about the bidet…. Ricky grew up in Morris County, and in the mid 80’s had started looking for a place of his own. 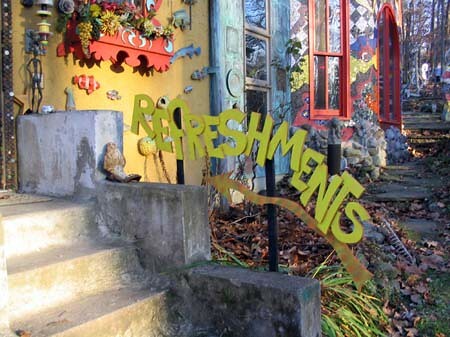 The building was in major need of repair, but Ricky immediately was able to envision it the way he wanted, and has spent 15 years working on his art, and working on the property which is still a work in progress. He often asks for help with supplies whenever he needs a large quantity of a certain materials (such as large quantities of Mrs Butterworth bottles), to the point where sometimes the yard looks like a junkyard. The 5 acre property has art everywhere, from the enjoy bench to the tiled covered table to the Eiffel tower made from bowling trophies. Then there are small little houses (huts might be a better word) that remind me of little displays you’d find at those winter wonderland sections you find at stores that sells gardening supplies. One of the huts will be a Christmas themed hut, which will either be Santa’s workshop, or more likely a place where kids meet Santa. Another hut was based on a story told to him by his father. While in Italy, a big whig in the Catholic church, possibly the Pope, but I believe more likely to be a bishop, visited this small poor town. A boy on crutches ambled by and the bishop declared the boy healed, and voila! so he was. The boy threw away his crutches and walked normally from then on. 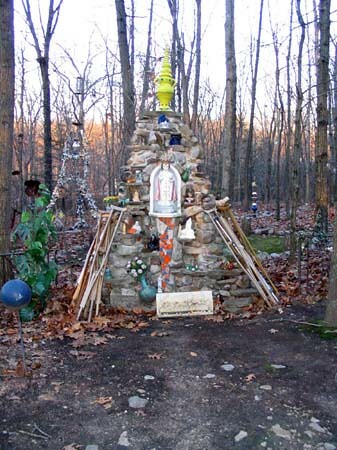 The hut is dedicated to religious icons, miracles and faith, complete with a half dozen discarded crutches outside. In Ricky’s workshop was displayed all of his jewelry, which, I must say was absolutely gorgeous. he had small and large pieces, intricate and simple pieces, pieces for the bookshelf, and pieces to be work. He really is very talented as a jewelry maker, and one piece caught my eye, pictured below. I believe it went for $300. 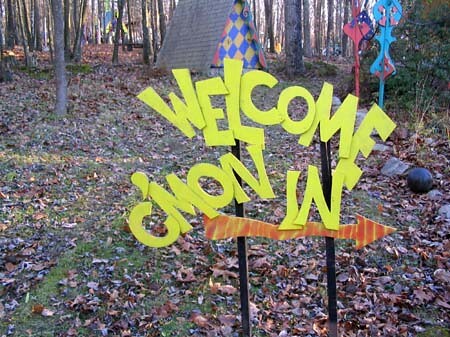 Although you can not visit his home except by invitation, you can see his work at craft shows and fairts in the tri-state area, visit his webpage for details on where and when he’ll be on display. Attorneys for Upper Ringwood residents have reached a tentative settlement with Ford Motor Co. in a multimillion-dollar lawsuit against the auto giant for dumping toxic waste in the neighborhood more than four decades ago, according to a document obtained by The Record. Terms of the settlement were not released by the attorneys, and residents said on Friday they have not been told any details.But a letter from their lawyers sent to state Superior Court Judge Jonathan Harris in Bergen County this week asked for a four-week stay in court proceedings to finish the “tentative global settlement” and get the signatures of all the plaintiffs. “I don’t know what the dollar amount is, but our attorneys took a risk representing us, so what they get us – so be it,” resident Vivian Milligan said as she dressed to attend a wake for another community member. “This wasn’t about the money. It’s about what Ford did to us.” The deal will include an agreement with Ringwood, which was also named in the suit for allowing Ford to dump. But borough officials, like all the attorneys involved with the suit, declined to talk specifics. “I can’t talk about the amount, but the borough should have full coverage for the settlement from our insurance carriers,” said Mayor Walter Davison. The attorneys’ letter, dated April 15, was sent by Sullivan Papain Block McGrath & Cannavo P.C., part of a self-described A-Team of lawyers that represents the residents. It is unclear how much money the attorneys will receive from the settlement. The New York City-based firm teamed up with Robert Kennedy Jr.’s New York practice, The Cochran Firm based in Alabama and the community’s original lawyers, Catalano & Plache of Washington, D.C., to force Ford to pay for health problems and property damages the residents’ blame on the contamination. The suit didn’t ask for a specific amount but at the time it was filed, attorneys were talking about seeking $2 million per plaintiff. Matthew Plache, who has represented the residents for over five years, would only offer, “We’re pleased that this community has benefited from the focus and attention of so many in our efforts to bring them justice.” Cancer, asthma, and skin rashes plague the mountain neighborhood and many say it is from walking, playing and inhaling the toxins. As children, they rubbed the multi-colored sludge on their faces, slid down hillsides of it, and squished it between their fingers. More than 600 residents, including hundreds of members of the state-recognized Ramapough Mountain Indian tribe, signed on to sue Ford. Ford’s stance has been there is no way to prove the waste caused the illnesses. The company said much of the damage could be from lifestyle choices such as smoking. For a while, community advocates talked about having Ford pay to move everyone out of the neighborhood. But some, anchored to the land by generations of tradition, said they wouldn’t move. Then, as the economy sagged and Ford’s financial future looked shaky, a simple payout became more likely, said sources knowledgeable about the case but who spoke on the condition of anonymity. A mass tort lawsuit is normally settled with a neutral party brought in to decide how much each plaintiff gets. Those who have lived in the community longer and have more serious health ailments will most likely get a larger amount than those who lived in the neighborhood briefly. To many residents, a settlement is vindication. “This shows we’re not crazy, it wasn’t all in our minds: Ford poisoned us,” Milligan said. The suit, filed in January 2006, bounced back and forth between state and federal court before ending in state court, and depositions were underway. But because every plaintiff had to be deposed, it appeared the suit would drag on for years. Ford spokesman Jon Holt confirmed that “settlement discussions are underway” but declined to talk about the case. Ford dumped swaths of lead-based paint sludge, solvents, and other industrial trash over acres of woodlands in the Upper Ringwood neighborhood and nearby Ringwood State Park. The company has been cleaning the area steadily since 2004 and, periodically before that when waste was discovered going back to the 1980’s. The area was listed as a federal Superfund cleanup site until 1994 when the federal Environmental Protection Agency, relying on Ford’s assurances of an adequate cleanup, de-listed it. Subsequent resident complaints about mysterious illnesses and remaining piles of visible pollution led to intervention by environmental groups and state and federal lawmakers. The EPA, conceding it erred in its de-listing of the site, has re-listed it as a Superfund site. Since 2004, Ford has removed an additional 35,000 tons of toxic waste. The Record has documented the pollution case in its continuing Toxic Legacy series, first published in 2004. When the A&P opened he would sit in front of the store and greet the shoppers with a hello and a wave, then head on over to the Cranberry Market & Deli for more waving. He did this for nearly 40 years…. Willie didn’t do this his whole life though. He served in the army during WWII, and was a bartender and a firemen. What he loved the most was waving. Left hand was for northbound traffic, right hand for southbound. Sadly Willie collapsed from a heart attack and passed away in 2000. As if they had lost a member of their own family, a little memorial Was left in his honor where his chair sat in front of his home. part of that memorial is a giant hand on a flexible metal pole. When cars goes by on 206 it creates a gust of wind which makes the hand going back and forth, like the ghost of Willie, waving eternally to the cars as they go by…. He liked to call himself Col Ruth Goshen, but to the residents of Middlebush, and to those who saw him in the Barnum & Bailey Circus, he was simply known as the Middlebush Giant. Standing at 7’11, and weighing over 650 lbs, Goshen was one of 14 children, and despite all of the children being rather large, he stood out amongst them. Reportedly Barnum himself found and recruited him for the circus. Goshens real name was alledgedly Arthur Caley. When Goshen died the funeral was held in his house and the 8 foot coffin had to go out the window. He was buried in an unmarked grave in the woods near the cemetery because he afraid curiosity seekers would try to dig him up. Boy scouts created the headstone for him in 1970. Ever suddenly get a song in your head for no reason and YOU CAN’T GET IT OUT? Yeah, the Numa Numa some was one of those songs a few years back. Gary Blosma (aka the Numa Numa guy) hails from Bergen County, NJ. He was really taken aback by the way it spread across the internet, and took the acclaim and criticism with grace. I don’t think he ever expected to be put into a an animated episode of American Idol. Unfortunately I got the song in my head this morning, and usually the only way to get a song out of your head is to listen to it. Now it’s in your head. Enjoy. Hoop doesn’t just make art, he collects it too. 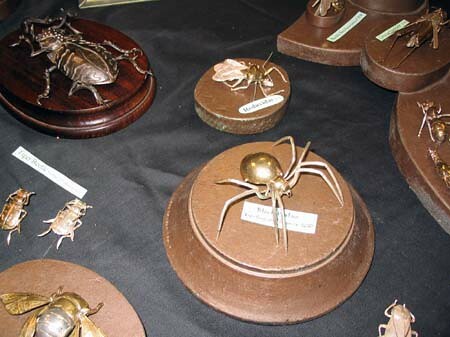 One part of his collection is a series of works by Jack Kevorkian, AKA Dr Death, or the Suicide doctor. The paintings are, as to be expected, rather macabre but extremely moving. Me thinks Mr Kevorkian has issues with authority figures, be it the church or the state…. Hoop began designing art cars in 1985, and often uses small foreign cars such as the Fiat 850, the Italian Isetta, the Volkswagen Beetle (the old kind) and small 3 wheel cart vehicles. He often covers his vehicles with what is called fun fur. Since it comes in many bright colors, it is well suited to his type of art. Hoop has created time machines, space traveling vehicles, vehicles devoted to luck, and even a vehicle that is a self portrait. Hoop created the King of Art (and the requisite costume and crown) after appearing on some tv shows such as Richard Bey. It gave him a persona which made him stand out from other artists. Hoop is an artist by nature, producing not just art cars, but paintings, drawings and conceptual art as well. Hoop grew up surrounded by the Andy Warhol crowd that were part of the scene in east Village, and you wouldn’t need him to tell you that to know it. Everything about Hoop screams “artist” from his appearance and clothes, to his manner of speech and the way he carries himself. Hoop has a collection of celebrity fingerprints, which is exactly what it sounds like. He would attend parties in the city and if he saw a celebrity he would ask them for their fingerprint. It’s amazing how may of them would comply. In his collection of celebrity fingerprints are such people as the Amazing Kreskin, Captain Kangaroo, George Plimpton, Curtis Sliwa, Michael Anderson (the dwarf from twin peaks) Uncle Floyd, Tiny Tim, Bill Boggs, Allan Ginsberg, Cousin Brucey, Al Lewis, Joe Frazier, and the original Kramer, Kenny Kramer. Hoop dismantled this double ended van a few months before I met with him, but in this picture you can see the design is two van fronts married together, a rather Monster Garage type feat if you ask me. He told me that it always turned heads, and on numerous times he was stopped by the police, who would invariably go to the rear of the vehicle and then wonder where the driver was….This happened a few times in Montclair, but after the second time it was usually to have the officers picture taken with this most unusual vehicle. Much like the police of Long Beach are all familiar with Jessie James, I am sure most of Montclair is familiar with their resident art car artist. Hoop is a big fan of public art, and stated that many times he would drive into the city in one of his unusual cars specifically for the purpose of leaving it parked on the street overnight so people could look at it and marvel. He would often leave the Good Luck truck complete with wishing well, and would find money throw into it. He eventually put a pad of paper and pen next to it, and sure enough he would find that people had written their wish down and throw the paper (and some money) into the wishing well. Hoop entered the time machine into the weird car contest at the Lead East 50’s car show and came in second. Hoops notoriety in this area of art caught the attention of Mattel, maker of Hot Wheels contacted Hoop about creating an art car related to their new series of toy cars” city heroes” Originally they wanted a design based around a taxi cab but Hoop immediately squashed that idea. “Fireman and police officers are heroes, not taxi drivers.” Hoop mulled over the design and finally settled on a meter maid car which he decorated with over 1500 matchbox cars and other car related toys and items. Mattel wanted the car in time for a toy show at the Javitz center. It was debated what would happen to the vehicle after the show but Hoop convinced them to let him keep it, and that he would display it at various art shows or art car events.